Cream butter and cookie mix. Add powdered sugar and flour and mix until well blended and crumbs are fine. Add egg whites and mix until well blended and mixture sticks together. Add red food coloring, several drops at a time, mixing after each addition until desired pink color is achieved and is uniform throughout the dough. Stir in chocolate pieces. With a 1-1/4 inch cookie scoop (or by rounded spoonful), drop cookies onto ungreased cookie sheet. Bake for 10 minutes, or until set but not brown. Allow to cool on cookie sheet for 2 minutes before removing cookies to cooling rack to cool completely. The amazing response to Tablespoon blogger CheekyKitchen's original post about pink cookies for breast cancer awareness was stunning! Thousands of you spoke out on Facebook, punching "Like" and commenting on Brooke's amazing pink cookies article, making it clear that breast cancer impacts nearly everyone, and that nobody is more than a degree or two removed from this hot-button health issue of our times. 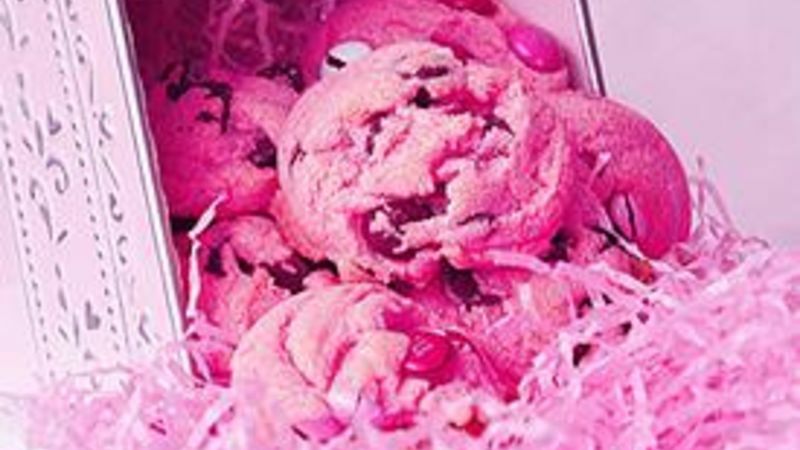 While the idea was fab, the recipe for pink chocolate chip cookies left many frustrated. We can only guess that there is some difference in butters, powdered sugars or something else that is causing all the trouble. SO ... we read your comments and are responding with an even better, NEW Pink Chocolate Chip Cookies recipe. One that'll work for everyone, so everybody can bake perfect pink! Please, whether you tried the other version or not, try this one. They're pretty. They're pink. And they carry a very special message. And they're even super easy, too. Valentine's Day is around the corner. Why not bake a batch for a sister, mom, co-worker or friend who is committed to beating this disease? Or one who already has? We're tickled pink to bring you this new recipe. Bake it with passion -- and pass it on!